…. and you knew there would be a story – as there usually is. Wow – it’s always great when you can feel your feet, and my rain pelted eyeballs don’t hurt nearly as bad now, as a result of my worn-out goggles or old Seadoo; then I could go on; I’m the old guy of the group; what’s your excuse? Come to think of it, Lewis – Club founder, is either a year older or younger; and Lee Pham, the competitive racer of the group is probably older than all of us. 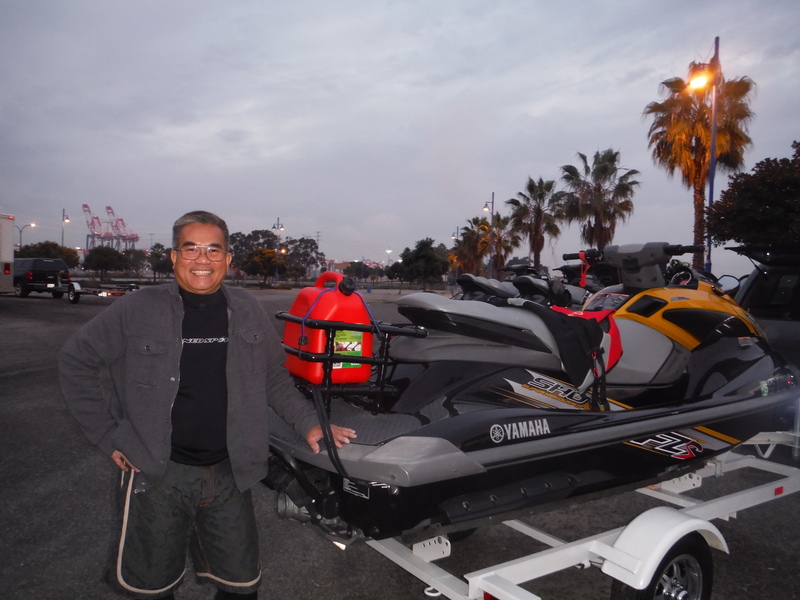 In my attempt to make our clubs official start of the year ride – January 10, 2015 – Long Beach to San Diego and back sound really bad (for those that missed out) I report to you that two Yamaha’s and a Seadoo got flipped by the Oceanside surf, knocking riders in the surf, in our 60 degree water. Bathtub lukewarm water to those unfortunate few reading this story where your daily temperatures in January are now in the ‘teens. The polar bear three (Caccius, Bronson and I’ll call our third rider Thanx) went in for a closer look at the rather large surfable coastwise swells and waves. Caccius I am told, may have started a chain reaction when the other two moved in for a closer look. More famous words were never spoken (Bronson – the WAVE, it suddenly came out of no where; the Look-Out on the Titanic’s crow nest – ICE, ICE – it suddenly came out of nowhere!! Could it possibly be that all were traveling a wee bit too fast – just guessing. The video below of the surf on the breakwater entrance to Oceanside is normal for this area. What these guys tried to surf was huge. In a separate video three of us got caught in the kelp line – the rest of the fleet was offshore in the calmer waters. This reoccurring theme happened on more than one occasion when skirting the coastline is the nicer option vs gps navigation from way point to way point. One guy takes off, the others follow, then suddenly (ooooooh, shiiiiiiiiit – we are in the kelp line!!! Stop and you will likely get tangled and won’t get started again – keep going fast and you stand a good chance of becoming a watercraft lawn mower or weed wacker mowing through that boat or watercraft immovable force we call kelp. The plan is to let the front guy who screwed up by going in to the kelp find a way back out – on most occasions you follow close, but not that close so that if he bogs down due to the heavy kelp being sucked into his turbine. It’s like two lawn mowers in line, the first one mows down the heavy grass and the second one mulches what is left. 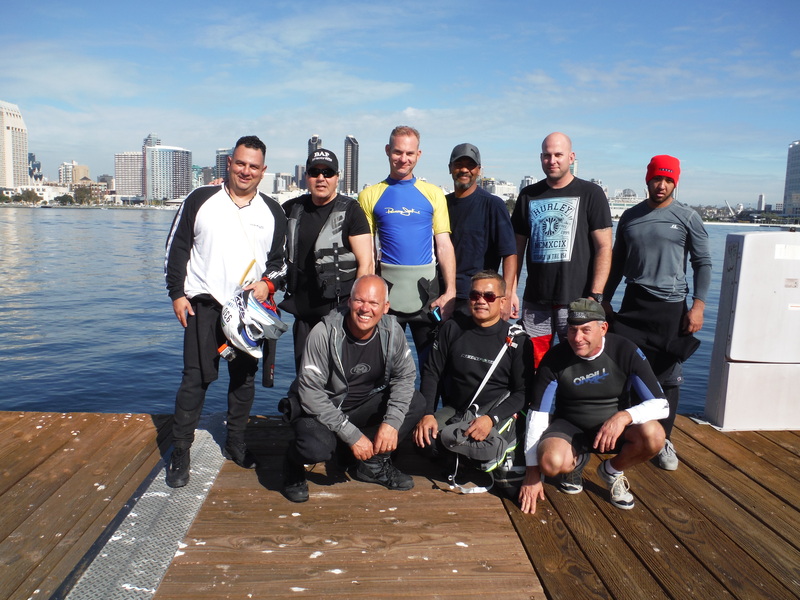 Our group of seven met up at (0600 for a 0700 start) at Long Beach, California – just as the sun started to rise! The ship you see on the right in the picture below is of the Queen Mary. I am suddenly reminded of a sailor’s ditty – red sky in the morning, sailor take warning – but, not this morning – at least not in San Diego. On the way down the coast (Oceanside, California) the club met up with four other riders, with Fleet Captain Jay leading the charge. Fadi and two other riders (insert name here) met up at the Oceanside fuel dock; where they only serve up 91 octane – which is precisely what this arriving group needed. c) sad droopy face, to beg fuel from the rest of us. Today was not to be – NO BREAK-DOWNS and NO ONE RAN OUT OF FUEL. A rarity, perhaps because there were no Kawasaki’s in the group to jinx us. The oldest Seadoo’s – 2005, 2007, 2008, and the rest were Yamaha’s in 2013, 2014 and even one 2015 FXVSHO. Knowing full well that my wife Patti never reads this far, feel free to email her to tell her I am looking a bit ragged these days, while sporting a 2007 Seadoo model. (PattiLynn741957@gmail.com) and you can keep this between us. Enough said. Once the arriving club members (West Coast five) fueled up at Oceanside, California, on the ride home I found myself in the lead with no one following. Signs of a bad leader? No – I just wanted to get back before nightfall – a little something I learned a long time ago called time management. From my distant vantage point I am able to observe Lewis’ Yamaha and what appeared to be the other three riders surfing those giant Oceanside rollers. I even said to myself – “58 miles to go, two hours from sundown and these guys are burning precious fuel they will need to make it back to the launch ramp.” At 60 mph we are lucky to go 60 miles. Could one of those four be sporting a sad droopy face? Remember what I said above: Most of us, either wise or experienced, carried in our arsenal a) hidden fuel cell; b) external fuel; c) sad droopy face, to beg fuel from the rest of us. But how wrong I was! Actual real life conditions on the Pacific ocean we faced today on our ride from Long Beach to San Diego bay. And the further south we rode the sunnier the day. Note the dead calm water conditions looking towards Seaport Village and downtown San Diego. A sailboat race was in progress and I noted one guy dropping anchor to keep his boat from rolling backwards away from the finish line. If you’ve ever heard me say that any good ride that goes good will always have the “Pay the Piper” component on the return. Here is a short description of what I wrote back in 2008 when my Seadoo GTX LTD was brand new. Now here I am today – seven years later riding the same Seadoo. If only my Kawasaki Ultra would’ve lasted half as long. Remember what I said above – she listens to you. “If only I had said that the difficulty level of this ride on a scale of 1-10 would be a 5 but, because of the Santa Ana hiccups on the way back up it shot up there to a 9. Just after leaving Oceanside we encountered some nasty freak swells that, when I came down from a freak wave, so did my hood and then it popped up broken. Note to self: Is it ever a bad day riding on San Diego bay? Everyone is boater friendly even the police and military patrol boats. “An adventure is an event or series of events that happens outside the course of the protagonist’s ordinary life, usually accompanied by danger, often by physical action. Adventures like this one almost always move quickly, and in our case the plot is at least as important as the characters! In the picture above, a Navy guy, a retired guy, loan officer, race car driver, and even a millionaire sporting sunglasses; and a guy (clubs founder) who was earlier seen conducting business via his iPhone while sitting on his Yamaha. Probably just a call from another member wanting to join. Just in jest of course – what a great guy; he even bought us all lunch and at Oceanside we all managed to use just one American Express card to fill up! Lewis – is that my phone ringing? Bronson – Poor guy froze on the ride home (aka: Hypothermia) he will forever be known as the cold water plunge guy. Also cold on account he was unable to fit into his two-year old wet suit, so he had to wear the shorties. Great for San Diego bay riding but not for paying the piper on the way home – rain and lots of it! The closer we approached Long Beach to the launch ramp the more mother nature pelted us. At some point I simply took my goggles off and braved the pelting – do you recall my hurting eyeballs? Yes, I do admit that I strayed Caccius and Bronson towards the surf line at Huntington Beach, in my attempt to cut off some distance – but then the breakwaters of Huntington and Los Alamitos Bay got in the way. Off went the goggles and it was now about 40-50 mph of how far will we get better the fuel runs out? Our ride down the coast today was like going downtown, extremely calm and peaceful. Never got any worse than what you now see in the pictures. On our way back up, just a bit after Oceanside, at about 3:30 p.m. it already began to look like nightfall. The same clouds in the same sky, now looked somewhat threatening. The seas held except that on occasion you found yourself in a different wave set. Then all you needed to do was look out into the distance to find the offending boater, whose wake was the cause. Common sense to experienced riders but, maybe not so to some are to never ride alone, if you can help it. Buy and maintain a NEWER Seadoo, Yamaha or Kawasaki. Hint! 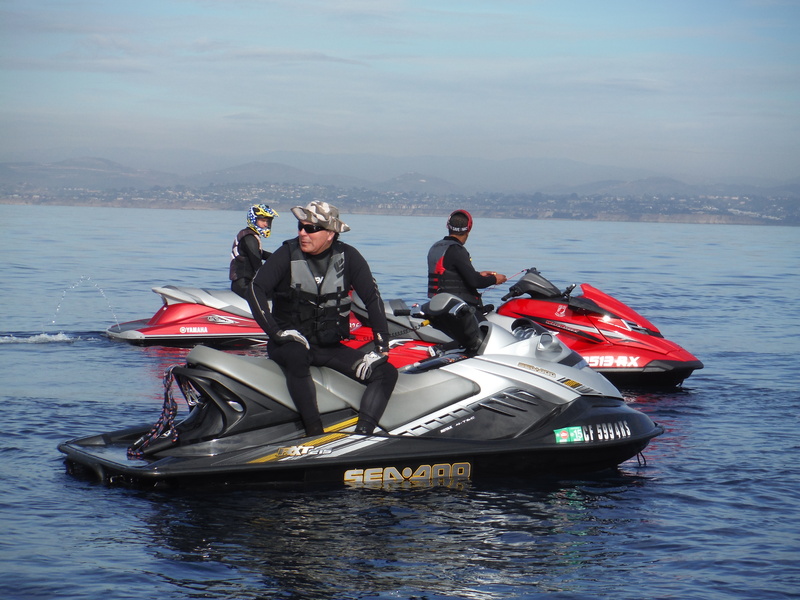 This entry was posted in Personal Watercraft and tagged Oceanside, San Diego bay, watercraft. Bookmark the permalink.